Before I had kids, I thought you had to have a high speed quad to be a worthy ski resort. Upon review, and after raising two skiing kids, I now recognize that you need a mascot to be the real deal. Mascots really do make a difference. It took the ski industry a while to recognize what Walt Disney knew from the start. That is, resort employees come and go, mascots stay, make the kids want to play, and give the resort a happy identity. Fuzzy friends breathe life and loyalty into otherwise basic base lodges and standard ski schools. Kids adore characters (expect for the occasional timid toddler that finds a 6-foot mouse terrifying). Mascots make people smile with their warm fur and big paw waves. My kids loved Sugarloaf’s Amos the Moose when they were 5 and 6, we even skied to Amos’ cabin on the mountain along Moose Alley. Our kids just couldn’t get enough of Amos and Blueberry the Bear – so they insisted on going back to ski school the next day, no hesitation – no bribery needed. Sister resort Sunday River now has Eddy the Yeti – with his own chalet located along the Kids Adventure trail, trying to keep up with Sugarloaf’s Amos. Ski Utah has the Ski Utah Yeti, and Deer Valley has mascots Bucky the deer, Quincy the Bear, Ruby Racoon and Silver the Eagle. Vail Resorts have Ripperoo mascots – oversized powder hounds that travel around Vail, Beaver Creek, Keystone Resort, and Breckenridge. Mammoth in California has, of course, Woolly the Mammoth mascot, and Big Sky Montana has Freemont the Moose. As a parent, I also appreciate that a mountain mascot can use his (or her – equal opportunity amongst the four legged) magical power to pass along safety messages. Who would you rather listen to: a white Bengal tiger on a snowboard, or a scary ski patrol with an ice pick and an icy beard? My advice to ski resorts: if you don’t have a mascot – create one, or adopt the National Ski Area Association’s Snow Monsters. Of course, having a 6-foot furry costume in a ski school locker is not sufficient. Characters need to be out and about, pressing their furry flesh, welcoming families on arrival, waving to kids at daycare and ski camp, appearing at resort events. My advice to parents, take your kids to family ski resorts with Snowboard Beavers and Powder Pigs. Make skiing fun with games about the skiers’ responsibility code, and teach your kids the Legend of Ullr, the god of snow. 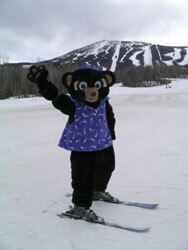 When it comes time to plan your family getaway, seek out ski areas with silly mascots like Gunstock’s Gunny the Bear and C-more the Penguin at Cranmore. Don’t under estimate the power of a powder pig or a penguin. 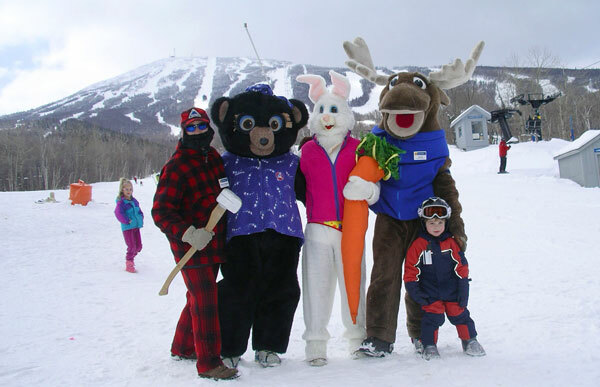 Mascots can make a ski vacation a little more magical.